Today I’m blogging about something I’ve been passionate about, especially lately, with my “after school” clients. There’s nothing like a fresh can of Play-doh; it’s only comparable to opening a box of unused crayons. There’s no mixed colors or hard, dried-up chunks. It just makes me smile. Surely, I’m not the only one it has that effect on, right? 1. Dough activities can improve play skills and social skills at the same time! Do you have kids who are stuck at the level of solitary or parallel play? Do you need to push them up the hierarchy of play skills (solitary play, parallel play, interactive/symbolic play, pretend play, rule-based play)? Well, using playdough can certainly be a solitary activity, but when you add an adult or peer, you’ve got instant parallel play. Dough activities facilitate sharing the cans of dough, passing tools back and forth, requesting different cans of dough from the play partner (using AAC, signs or spoken language), and these interactions can transform parallel play into interactive play. Later, adding props to the activity (like candles to stick into a “birthday cake” you’ve made together and blowing out the candles) can push it over into pretend play. Encourage your students or clients to tell their play partner all about what they’ve made or to ask what his/her partner made. When that’s happens, you’ve got social language! Basically, turn it into a social play experience! We know how to do that; the dough just helps up make that happen. 2. 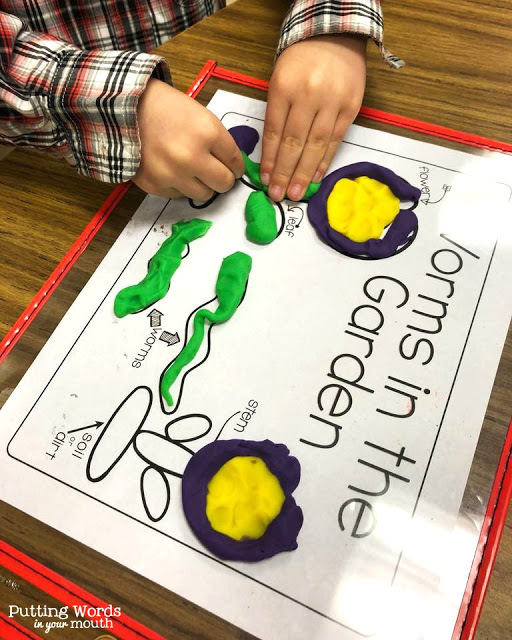 Playdough creates interactions that ideal for growing language and literacy skills! Ohhhhhh the language that can grow out of a good playdough session! Besides the social language opportunities just mentioned, the language opportunities are through the roof! Children can explain what they’re making and what they’re doing to make it. Meanwhile, we should model language by commenting about their work “Oh, you cut it in 3 pieces” or “I’m making a ball, too.” Then ask questions that prompt children to describe their color choices, actions and thinking behind their creations (“Oh, are you making a sun?,” “I see your sun is orange. Why did you make it orange?,” “How many caterpillars are you making?,” “Will they be long or short?,” “What could you do to make it longer?”). You can talk about the tools they are using in the same way such as, “You’re so good at using the cookie cutter! What will you make next?” or “You used the scissors to cut the dough. What does the rolling pin do? What is that cookie cutter for? How does it work?” There are so many actions to learn (roll, pound, poke, push, stretch, slice, fold, flatten, shape, scrape, chop, cut, squish, smash, pull, open, close, give, share) and describing words to explore (smooth, lumpy, cold, wet, mushy, sticky, yucky, hard, soft, dry)! You can even help them make connections to real life; for example, if they make a red apple, say “Oh, I like red apples, but green apples are my favorite. What do you need to make a green apple?” It’s the perfect opportunity to build background knowledge about the fact that apples comes in different colors. If they make a hamburger or a taco, point out that we have those for lunch at school sometimes. Talk about which is their favorite. Dough creates something I like to call language palooza; it’s like an explosion of language skills! Also, the basic concepts you can address and practice in therapy with dough are truly endless! It’s the perfect way to teach and work on concepts regarding size, shape, color, position, etc. You can make long snakes and short snakes, big/large/giant balls and tiny/small/little balls. You can put items IN the can, UNDER the can and take them OUT of the can. You can make round pumpkins and square pumpkins. You can can address identifying and naming colors (by pointing or naming to request dough colors)…..Oh, but never forget that YOU, the SLP, must always always stay in control of the dough AND the session- to prevent a big mess…..You can put eyes ON worms; put worms ON apples, IN apples, UNDER apples and BEHIND the apples. You can make tall trees, wide trees, short trees and skinny trees. You can comment that you made a fat, fluffy pancake while they made a FLAT one. Know what I mean? You can direct kids to put ALL the apples in the can or to give SOME/a FEW apples to their partner. They can make the snake they made climb OVER the rock, UNDER the rock, hide BEHIND the rock, or they can poke a hole and make the snake go INSIDE the tree. 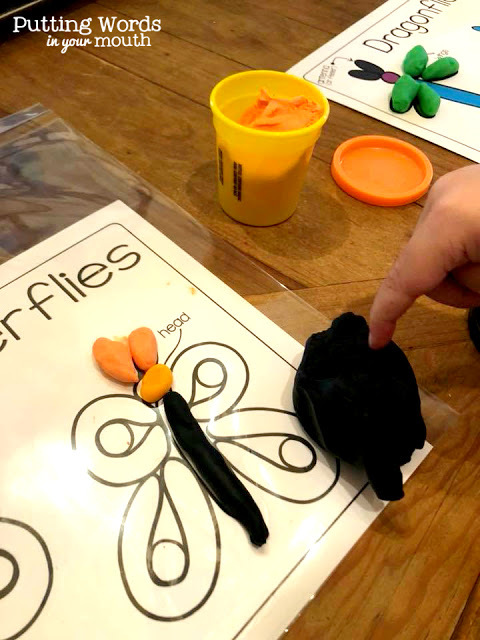 Your students can follow directions like, “Put one caterpillar at the TOP of the page” or “2 bugs at the BOTTOM on the page” You can direct them to make the worm crawl NEAR the caterpillar or AWAY from the flower. The possibilities really are infinite, and chances are your students will be more engaged with their dough creations than any worksheet, task card or 2 dimension stimulus you could give them. Tip: Use dry erase page protectors as your dough mat or put any purchased dough pages you have in them! Less mess! 3. Your OT co-workers will love you, and your students will reap the benefits of better hand-eye coordination, strength and fine motor skills! Even though our job is obviously to address the communication skills of our students and clients, I do feel a responsibility to invest in the whole child. It’s pretty cool that, while we can use dough activities to boost speech and language, there’s also the added benefit of it improving muscle strength in those little hand muscles. Also, as kids use their hands and fingers to poke, push, flatten, roll, etc. they’re developing their hand-eye coordination. All the while, their dexterity is improving. We all know that good hand-eye coordination and overall fine motor skills are important for self-help skills like feeding themselves proficiently, buttoning, zipping, snapping, tying shoes and taking care of bathroom needs. Later they’re crucial for the academic skills of drawing, writing, and later – even typing. 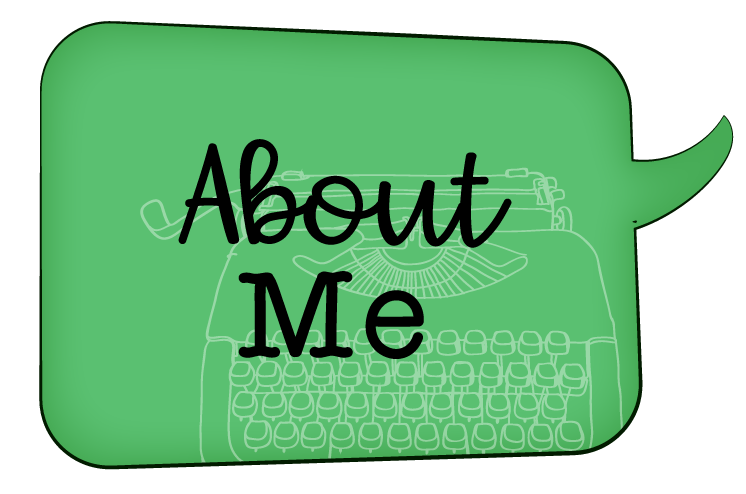 Since my goal as a school SLP is always academic success – fine motor skills matter! 4. Creating with dough can build creativity, imagination, and visualization. This is a biggie for me right particularly because I’m working with 2 third grade students who are struggling (to put it mildly) with listening and reading comprehension. They lack imagination; they cannot listen to even a very short story and imagine what is happening in the story (and either draw it or talk about it). It’s no surprise to me that they are struggling with reading comprehension in the same way. Don’t even get me started on how this is also affecting their narrative and creative writing. Being a self-proclaimed “artsy person” myself, I can’t imagine living without creativity and imagination, and I truly believe our students need it to be successful in school. Creating with dough an awesome way to flex our creative “muscles” so to speak. Most students love to create, (since at least in my creative expression time is scarce) and if your students are like mine, their creations are sometimes unrecognizable. Still, we can pretend those are aliens, monsters or mysterious creatures. The things they create can represent anything they want them to be. We can encourage them to use their imagination to….oh let’s see….imagine worms attacking a beehive and become the bees’ new king. We can actually make a work and beehive out of dough and make that happen. At the same time we can talk about how the worm feels, how the bees feel, what the bees might say to the worm king, and who might be the queen (sorry, my language wheels do not stop, and I always aim to get theirs spinning). Learning visualization (creating pictures in their minds) will eventually pay off big time when they have to either listen or read to comprehend. 6. It’s a fantastic medium for improving articulation, fluency, and even voice problems. This is 100% my opinion based on my personal experiences over the past 22 years: the sensory component of dough can really drive home speech concepts that children need to understand in order to improve their communication. Use the dough to form a tongue, teeth, and lips. Then demonstrate what the tongue should do to make a vocalic r “er” sound (for example). Form teeth and show that the tongue must “tap” on the teeth to make a good /t/. 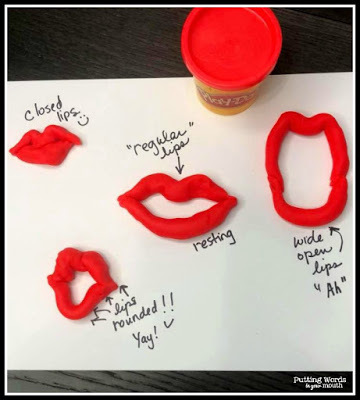 Shape dough into smiling lips versus rounded lips to teach lip rounding for those kids who are having difficulty with lip rounded for various vowels and consonants. Those are just few examples. 99.9% of your kids will be more engaged using dough than picture cards. Try it! Need to teach a child who deletes final consonants how to “say the whole word?” Make it a sensory/tactile experience with dough. If working on CVC words like “cat” for instance, have the child make 2 balls, pancakes or even 2 cats! Teach them how to segment or say the word in slow motion. They should poke the first ball when they say “ca” and then poke the second ball (or pancake or cat) as they mark the end with a strong /t/! This same concept works with children nwho have apraxia. Need them to alternate CV syllables? 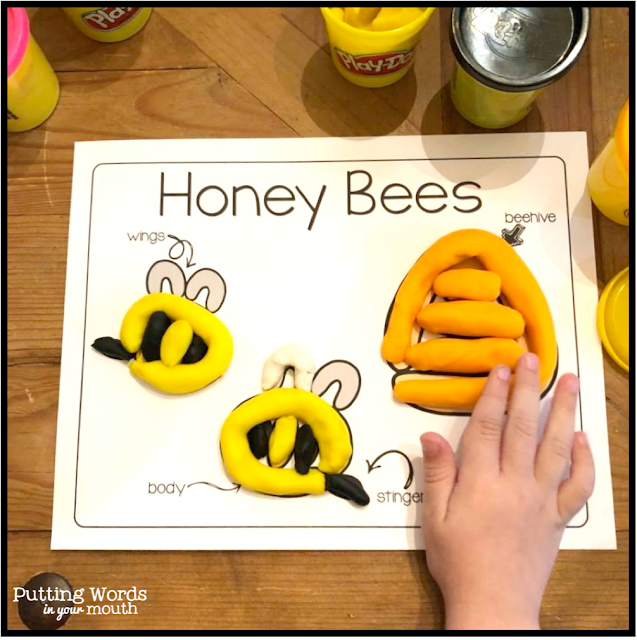 Then make a bee and a bow out of dough, and have them practice ‘bee, bow, bee, bow, bee, bow,” while poking the shapes they are speaking about back and forth. Make sense? There’s something about simultaneous hand and mouth movements that make these speaking tasks easier for kids when they are just learning the skill, and it’s certainly more interactive than mindlessly saying repetitions. I use this same hand/mouth concept in my Tackling Apraxia therapy materials. Use articulation words for drill that coincide with the items they’re creating. This is especially handy for group therapy. 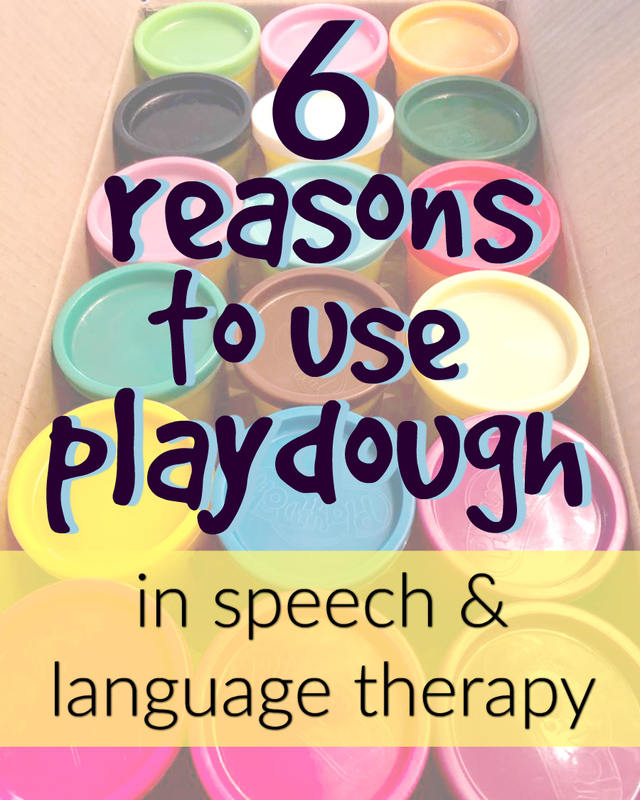 Since students in group therapy typically have to take turns practicing their articulation targets, letting them create with dough is a focused and productive way for them to wait their turn until the SLP comes back around to them. I like to use lists that correspond to the “theme” we are using with the dough such as the ones included in my Bugs and Worms dough activities. And finally, challenge students to make shapes that start with their target phonemes. The sensory experience that comes with working with playdough is great for teaching about smooth versus bumpy speech. Create shapes that are smooth and bumpy, and discuss what that means in relation to the child’s speech. Have the student listen to your speech (with fake stuttering thrown in sometimes) and decide whether your speech was smooth or bumpy. Likewise, after any speaking task you’d like to have the child try, have the child decide which dough shape (smooth or bumpy) was most like his or her speech during the speaking task. I personally like to work on “stretching” and “chunking phrases” as fluency enhancing techniques, and using dough is a great way to teach those skills! What other fluency enhancing strategies could we teach with dough? When engaging in the “counseling” aspect of fluency, manipulating the dough could be therapeutic for your students. I’m probably in the minority, but I love teaching voice skills. I love educating students about the voice and about healthy voice behaviors. Dough is a great way to demonstrate our vocal folds moving nicely. 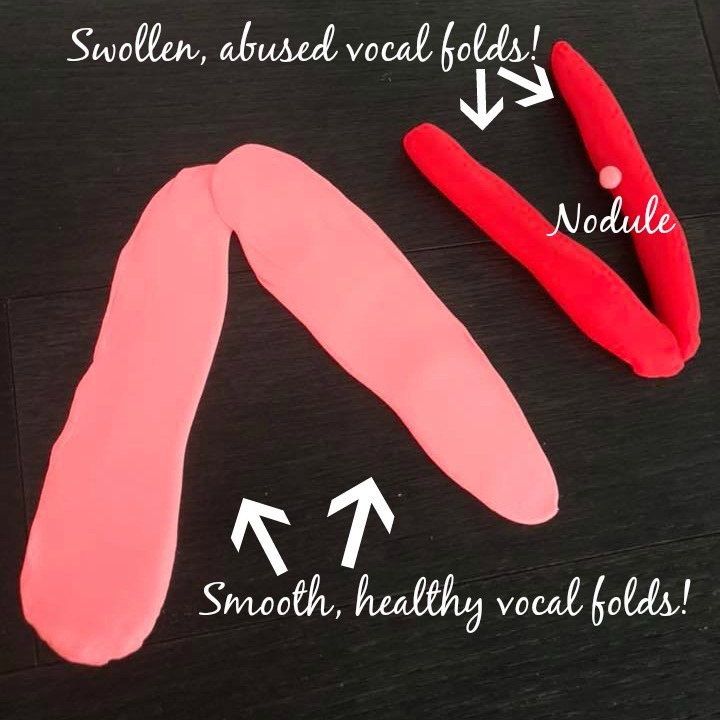 Make vocal folds (especially for your kids with nodules!!) To do so, make “pancakes” as flat as they can be by rolling out the dough very thinly. Cut the dough to make 2 long strips of long, flat dough. Demonstrate how healthy vocal folds move by holding them both up and gently having them move in a waving motion against each other. Try to get them to “undulate” like real vocal folds do. Then make vocal folds that are less flat so that you can make them hit or bang against each other (without breaking unlike the thinner ones) to demonstrate a hard glottal attack to students. Explain that when they bang against each other (when we yell, clear our throat, cough, or make loud noises, revving noises, growling sounds, etc.) they eventually can form a nodule. Create a nodule with dough and put it in the vocal fold. Explain how that little nodule can change our voice. Discuss healthy and unhealthy vocal behavior and demonstrate what the vocal folds do for each one. For each behavior let the student decide if the voice folds are behaving like the healthy undulating vocal folds you made together or the “banging” vocal folds made of dough. 6. Using dough is calming, therapeutic and useful for addressing social/emotional issues. Do you have a stress ball? A fidget? Mine are currently Aaron’s thinking putty and the popsocket on my phone. 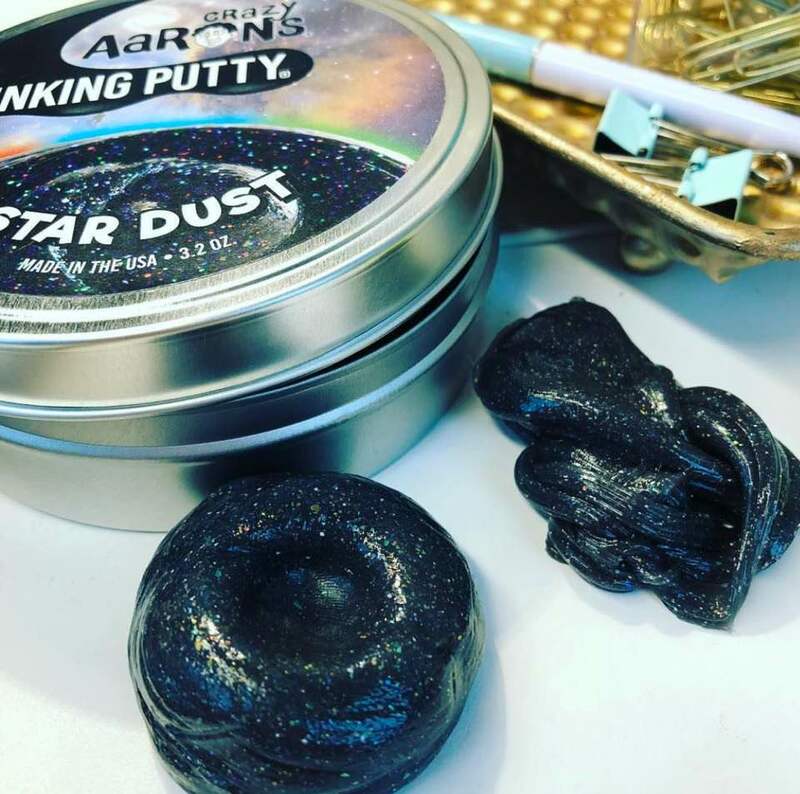 Truly, I can’t stop playing with that popsocket, and my treasured thinking putty is basically grown-up play dough. I squeeze, shape, poke and squish it when I’m stressed. I pick it up when I answer the phone, and I often roll it around in my hand while sitting in long meetings. It calms me, occupies me and helps me channel my emotions (I have a lot of them, y’all). Dough can do the same thing for our students. I don’t know about you, but over the course of my career, I’ve worked with many angry and/or fearful students. Dough activities can be soothing. Also, pounding, cutting, and squeezing can be productive way to release pent up energy. It can boost concentration, too. I don’t think there’s one SLP on the planet who hasn’t met a child who could use something to help him or her focus. On the communication front, I like to use it while discussing emotions. 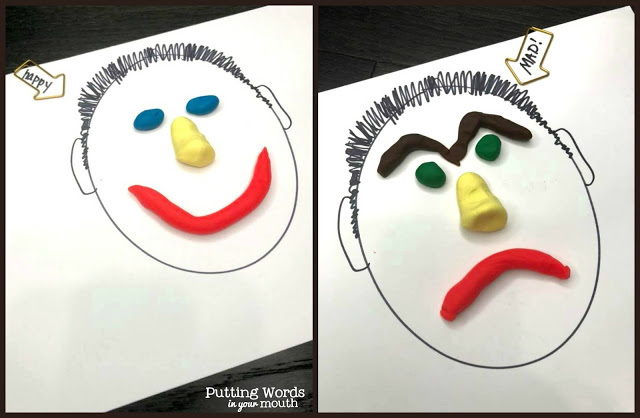 Playdough is fun to use to build faces with all sorts of emotions, and those activities can spark much-needed conversations about feelings and how to deal with our feelings. So here is a confession before I leave you… while I have used dough at work for as long as I can remember, I didn’t allow it at home with my own kids! After one “Play-doh squashed into rug” incident, it was banned forever! I was younger and less wise then (not yet realizing that memories and fun are much more important than a clean and cute house). Now I am the cool aunt that breaks out the big box of playdough when my nephews and nieces come over (because it’s banned at their house also). Find a contained area that easy to clean and bust out the playdough OR just let loose and get messy. Kids big and small will thank you for it. 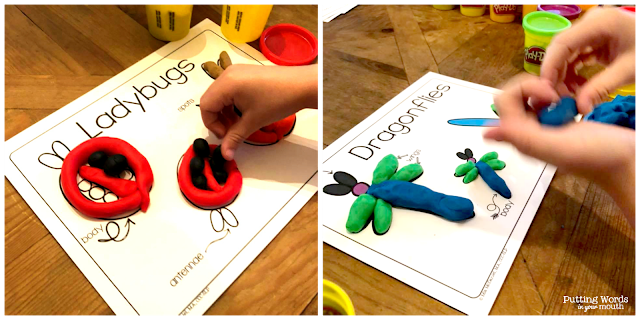 To check out my newest dough activity, Bugs and Worms, that includes themed articulation lists and tons of specific language tasks all laid out for you, just click HERE. 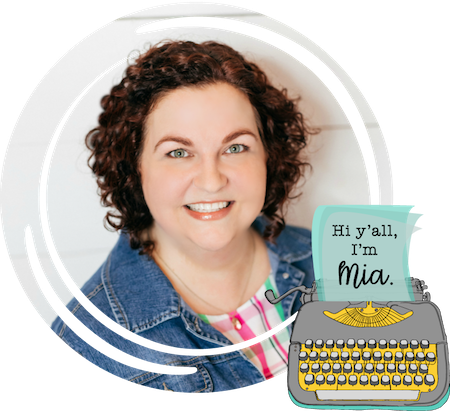 It’s perfect for springtime or anytime, really, and is a fun companion if you’re reading The Very Hungry Caterpillar or using a “bug” theme in therapy! How do YOU use dough in therapy? I’d love to hear about it!! This is really cute. Do you have other playdough sets in your shop? Yes, I do have a Halloween freebie with playdough and a fall apple product. I'm just going to go ahead and add a category to my store called" Dough activities." 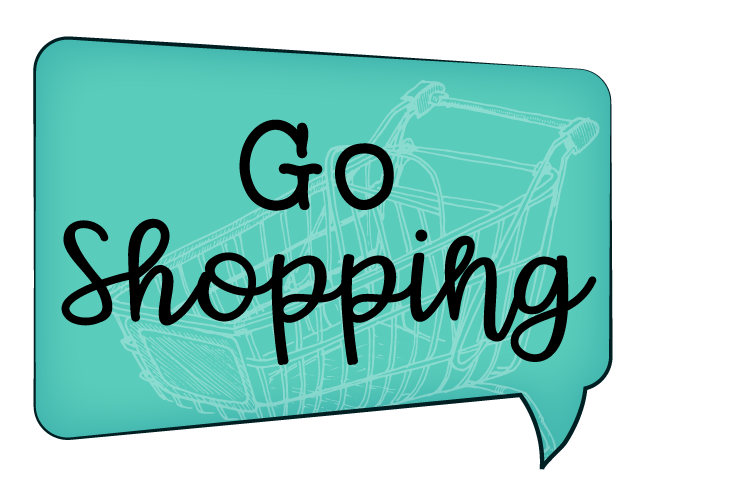 It will be on the left side in the long list of product categories. Thanks for asking, Andrea, and for reading!